Industrias Galfer launched the new 2019 advertising campaign combining its two primary areas: motorcycle and bicycle. 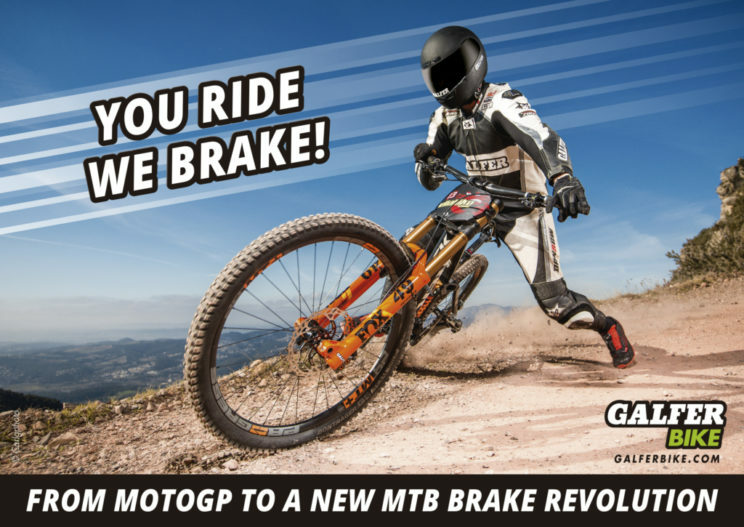 With this campaign GALFER wants to show MTB users that their brake products high performance is the results of many years of studying, testing and developing brake products in the MotoGP most important international circuits of the world and many other international high-level competitions (WSBK, WMX, WSSP, WEC, WTC). “YOU RIDE WE BRAKE” is what GALFER has been doing for years, celebrating world titles by riders as great as Marc Márquez (2010-2012) or Jorge Lorenzo (2006-2007) at the start of their MotoGP sporting careers; fourth times Enduro world champion Steve Holcombe (WEC); six times Motocross world champion Kiara Fontanesi (WMX); or 25 times Trial world champion Toni Bou (WTC). These are great names of the international motorcycle scene that help develop GALFER brake products. The bicycle area benefits too from their contributions and technical knowledge. 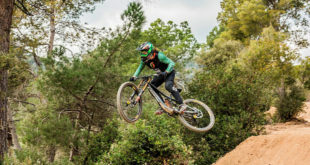 That’s why we wanted to explicitly show it with the image of a mountain biker dressed as a motorcyclist with a DH bicycle at the edge of a cliff. We realize that both motorcyclists and cyclists want a safe and powerful braking so they can make a difference both in race and everyday use. Thanks to the pairing of motorcycle and bicycle GALFER is able to offer all these benefits. Besides, they were the first manufacturer in the world to introduce mass production of brake discs and pads, back in 1998. This is how Galfer Bike wants to share their history and the origins of their brake products manufactured in Granollers (Barcelona) for over 65 years. In fact, the engineers and operatives involved in the production process for brake discs and pads of bicycles and motorcycles’ disc systems are the same; the raw materials are similar and they are both manufactured with the same equipment but in different sizes. 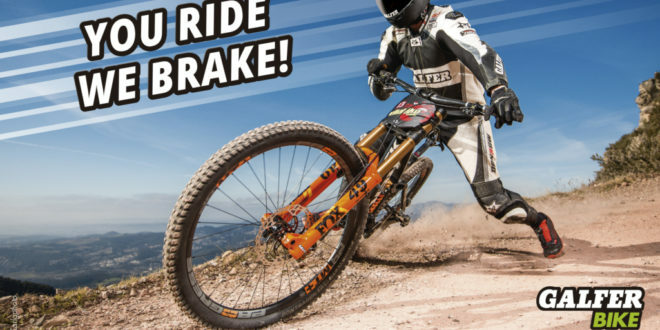 If you are a mountain biker who wants to feel like a motorcycle rider you’ll have to use Galfer Bike brake products.